For P not on the circumcircle of an equilateral ΔABC, there exists a triangle with side lengths equal to PA, PB, and PC. For a proof, pass through P lines parallel to the sides to obtain points A', B', C' (or A'', B'', C'') on BC, AC, and AB, respectively. There are two triangles to consider: A'B'C' and A''B''C''. For P on the circumcircle, Pompeiu's triangles degenerates into a straight line. Hubert Shutrick has observed that the triangles A'B'C' and A''B''C'' are obtained from each other by a rotation through 60°. 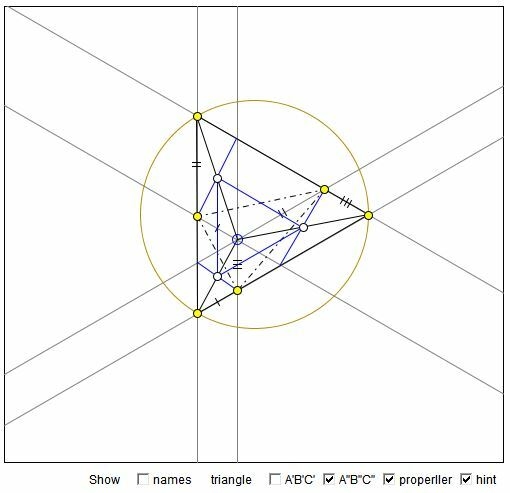 This is because each of the three triangles PA'A'', PB'B'', PC'C'' is equilateral. ∠B'A'C' = ∠B'A'P + ∠C'A'P = ∠B'CP + ∠C'BP = ∠BPC - 60°. This is because A'CB'P and A'BC'P are isosceles trapezoids which are cyclic polygons. Angles A'B'C' and A'C'B' are treated similarly. ∠B''A''C'' = ∠B''C''P + ∠C''A''P = ∠B''CP + ∠C''AP = ∠BPC - 60°. PA < PB + PC. As an aside, triangles A'B'C' and A''B''C'' mentioned previously form the configuration of the Asymmetric Propeller. The midpoints At, Bt, Ct of B''C', C''A', and A''B', respectively are the midpoints of PA, PB, and PC so that the equilateral Δ AtBtCt has sides parallel to those of ΔABC and is a homothetic image of the latter with center P and coefficient 1/2. This is so because, for example, the quadrilateral A'BC''P is a parallelogram, implying that the midpoint of A'C'' is also the midpoint of PB.